Last week, we kicked off the first week of our Holiday Sale on PlayStation Store, and today we enter the second week of the sale. Following today’s PS Store publish, we’re discounting a new line-up of games at up to 60% off, and PS Plus members receive up to 80% off. We’ve also got an added bonus for you this week — use PayPal to add $60 to your PS Store wallet today through Tuesday, December 16th, and you’ll get a $10 PS Store credit. You’ll receive a voucher code for your $10 credit by December 23rd, 2014, via system messaging on PS4 and the email account used for your SEN account. The voucher code must be redeemed by 11:59 PM Pacific on January 22nd, 2015. 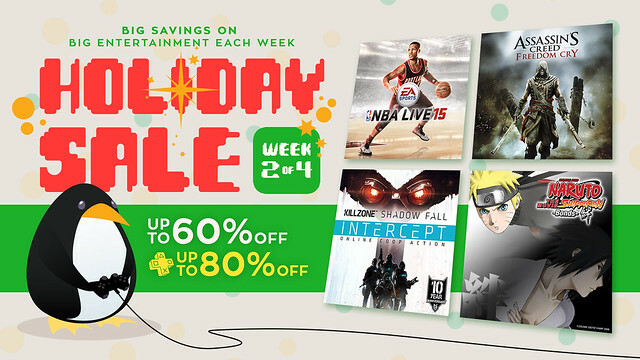 So load up your wallet and start snagging some Holiday Sale titles! Go to www.Sony.com/PayPal for more details. Week 2 of the Holiday Sale runs through Monday, December 15th. Make sure to check back here next Tuesday to see which titles will be on sale next week. What games are you going to snag? Is AC freedom cry dlc or a full game? Good question StealthBlade98. The answer is yes. (^_−)☆ Assassin’s Creed Freedom Cry was originally an expansion to Assassin’s Creed IV: Black Flag, however it was later released as a standalone title. The version on sale this week is the standalone version. It’s the 20th anniversary of Playstation but there aren’t any PS1 or PS2 classics on sale. Missed opportunity. A little birdie told me to ask you to stay tuned on that front Mokajige! ˎ₍•ʚ•₎ˏ In the meantime, did you see that Suikoden II has come to the PS Store??!! Not as good as last week’s. I’ll pick up Valiant Hearts. Why won’t the Killzone Shadowfall Add-ons be discounted, I have the game, it would be cheaper to buy the Intercept add on. Season Pass needs a discount please. Great point solidercell! I will pass on your feedback. Are you planning on grabbing anything in particular? Odd that Putty Squad, a multiplatform PS4/PS3/PSV game, is only on sale for PS4. This is a trend with sales that’s rather bothersome, honestly. Not too much interests me this week outside of maybe Entwined. Keep the sales coming though! Also is octodad going to be crossbuy with the announced vita version.? I’m happy to confirm that Octodad: Dadliest Catch will be cross-buy on PS4 and PS Vita! Please do better next week! Assassin’s creed freedom cry it’s cross buy ? Assassin’s Creed Freedom Cry is not cross-buy on PS3 or PS4. Thank you for Valiant Hearts: The Great War! What a great price, everyone should experience this game! Everyone, Valiant Hearts: The Great War is not to be missed; it has the Captain Cat Seal of The Greatest Thing Since Catnip. Nice sale, but thankfully for my wallet there is nothing I want. Unlucky for my wallet is that there are two more sales coming. Hoping for some great vita games. Ooh, not as good as last week. I guess you knew how bad black friday was and had to put a good showing. Most of those games should cost the plus sae price all the time. Specifically Crimsonland,valiant hearts, octodad, sparkle 2, and another world. RBI 2014 should be taken off the store entirely. @StealthBlade98, it’s a standalone DLC. You can play it without having Black Flag. I like this week, although I think it will be pretty divisive. I will pick up at least 3 games from this sale. Thanks gillettjoe! Let us know what you end up grabbing! Anyone who hasnt played Crimsonland should pick it up at that discounted price. Its a super fun little twinstick shooter that originally was released as shareware on pc. Fun. Fun. Fun. Blue Estate!!! YESSS!!! I played the demo and loved it! Totally worth the wait! For those of you who haven’t given it a shot, there’s a Free Demo. $4 is pretty darn good considering its regularly at $20. I still haven’t bought anything from this Holiday sale. I’m waiting on good prices for Spelunky, Child of Light, and PS1/PS2 Classics. Would love to grab Magicat Beat, but oh IT’S NOT AVAILABLE IN CANADA? Great. Lol, shows picture of Naruto but does not list Naruto. Come on Sony, give us at least the full Killzone game and not the bloody dlc pack. ahhhhhhhh kind of a let down… been waiting all week for this, not really interested in buying any of it .. Cant wait to see what the other weeks will bring though! How are you doing chen? Getting Another World for sure. Sony is not going to get many sales with this garbage. Meh. Looks like all I’ll be getting this week is the Venom table for Zen Pinball 2. Nothing on that list interests me. Wish you guys would group the titles on sale by platform rather than title, it would make scanning the sales much easier. I swear this was done recently and it made a world of difference to the readability of the page. I’ll be all over Blue Estate, I really liked the demo. Getting Valiant Hearts and Entwined; hopefully I won’t regret it. And why still no Magical Beat for Canada? Pain. Probably get Batman Arkham BlackGate Deluxe Edition for $10. Nothing else draws my attention to this sale. Been waiting for BlackGate to go on sale on PSN for the PS3 version. Meh. This list convinced me to grab Assassin’s Creed Liberation HD from the week 1 sale quickly, before the store updated today. Hopefully other folks are more impressed with this list. +1 on @42 – group the titles by platform, and then alphabetically within the platform list. I don’t have a PS4 or a Vita yet, so it would be simpler to find the sales I might like if they were grouped differently – most of us are in a similar situation (have 1 or 2 platforms but not ALL of them), so surely this would be helpful for the majority of us. EXCELLENT sales this week, much better than last! Finally Freedom Cry on sale, will be picking that up post haste, as well as Blue Estate for that price, which steep at $20 is a bargain for $4.